This week I had a lonely head of cauliflower in the fridge and wasn’t sure what I wanted to do with it, until I saw a recipe for cauliflower puttanesca in Real Simple Magazine. The pasta looked absolutely delicious and healthy, so I thought I’d try my spin on it. In case you’ve ever wondered, “puttanesca” is an Italian word that roughly translates to “whore’s style.” Apparently, back in the day Italian brothels used to make dinner for their “guests” using whatever ingredients were available in the kitchen. Hence, and puttanesca pasta is sort of a hodge-podge collaboration of capers, olives, tomatoes, vegetables, peppers, spices, and sometimes anchovies. So in case you were dying to know, there you have it! 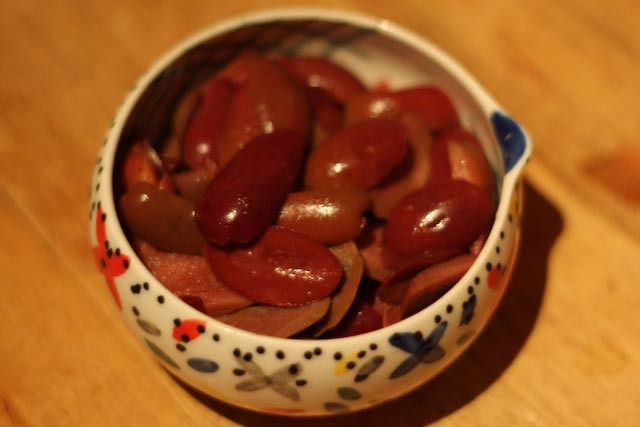 For this recipe I used Greek Kalamata olives. 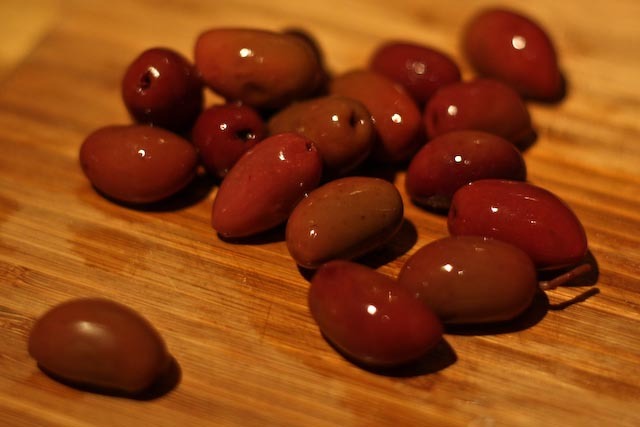 I love the distinct, briny flavor of these olives, but you could easily substitute with green or black olives as well. If you can find pitted Greek olives, more power to you. The ones I grabbed at the store were not pitted, so I used a paring knife to slice around the pit. It’s a bit more work, but not terribly complicated or time consuming. 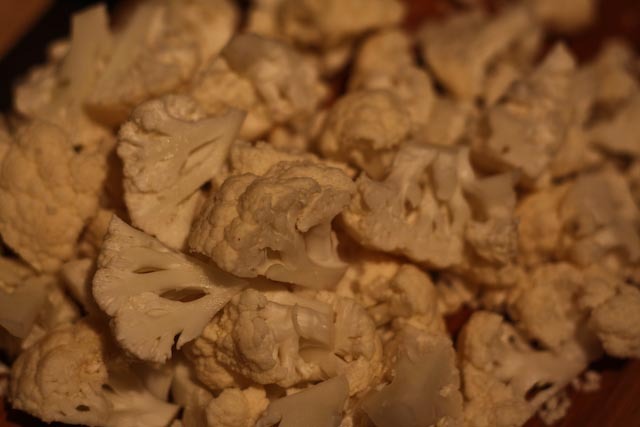 I cut the cauliflower into small, almost bite-size pieces. This helps it cook a bit faster and makes it easier to eat! Sauteing the cauliflower with plenty of onion, garlic and olive oil before adding the rest of the ingredients gives the cauliflower extra time to cook and makes it even more flavorful. I mixed a bit of pasta water and Parmesan cheese right into the sauce. This helps everything combine and also helps the sauce stick to the pasta. 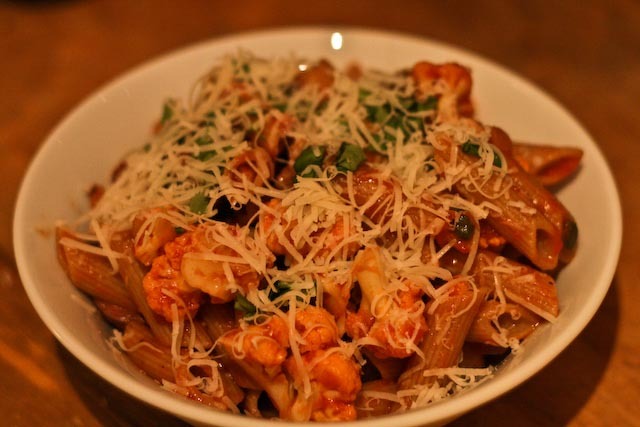 After all, you want pasta and sauce (together), not just pasta with some sauce! 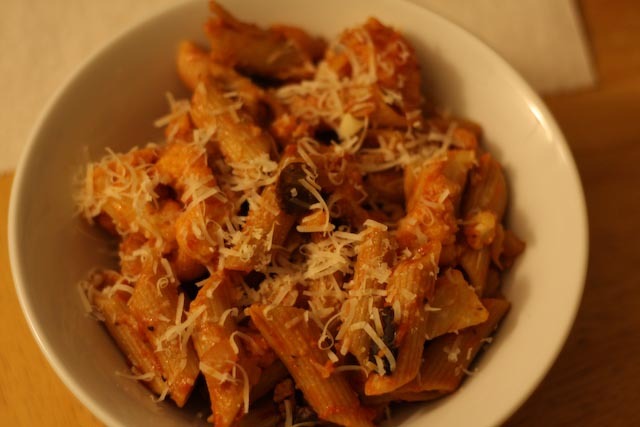 I chose to use a whole wheat penne pasta for this dish. Regular enriched pasta would work just great, and I think rigatoni, fusilli, farfalle, or tortiglioni pasta would also pair nicely with this sauce. 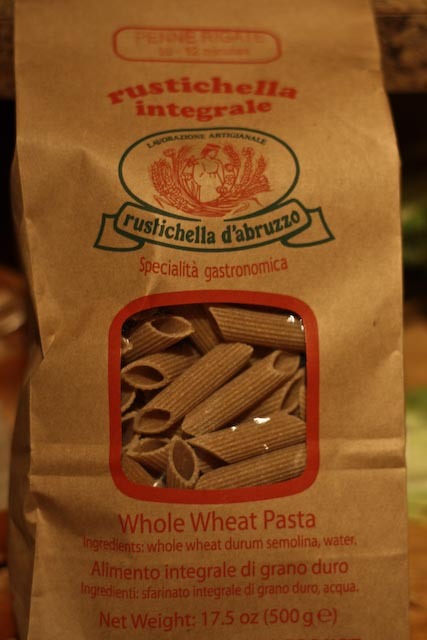 If you do choose to use a whole wheat pasta, my recommendation is to cook it a little al dente, as whole wheat pasta is not as stable as it’s enriched brethren, and will fall apart more easily if overcooked. 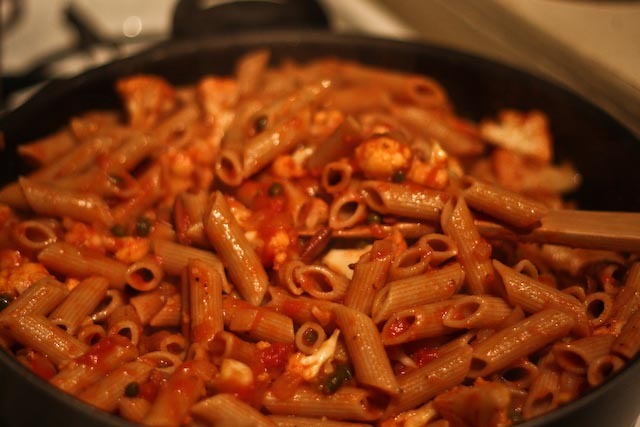 Mix the pasta right into the sauce pan to combine everything well and ensure that the pasta is well covered with sauce. I topped mine with a little fresh basil and some additional freshly grated Parmesan cheese. Drizzle a large, deep-sided skillet with olive oil, and add the onion and garlic. Cook over medium heat for a few minutes until the onion is just translucent. 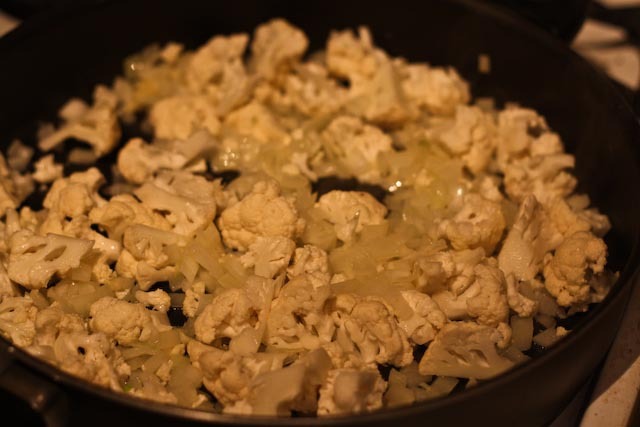 Add the cauliflower and cook, stirring often, for about 5 minutes. Meanwhile, cook the pasta according to package instructions, and reserve 1/2 cup of pasta water. Pasta should be al dente. Add about 1/4 c of water to the pan to help cook the cauliflower. Cook, stirring often, for a few more minutes until the cauliflower starts to get soft. 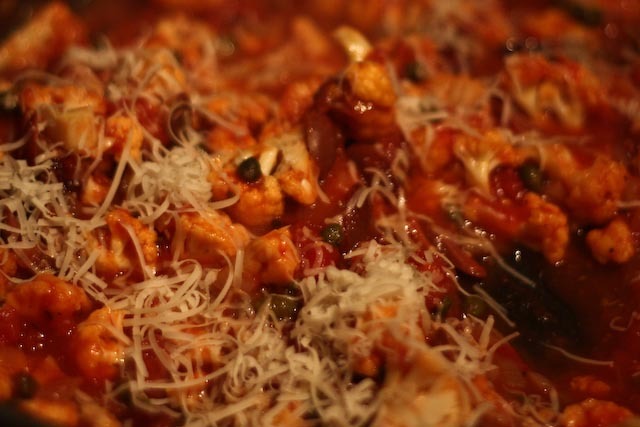 Add the diced tomatoes, tomato paste, olives and capers. Cook for a few more minutes, stirring often. Add reserved pasta water and 1/4 cup of Parmesan cheese. Add the drained pasta to the sauce, and stir well to combine. Serve with additional Parmesan cheese and fresh basil. Nutrition Information (Approximate Values): 500 Calories, 16g Fat, 14g Protein, 75g Carbohydrates, 5g Fiber. 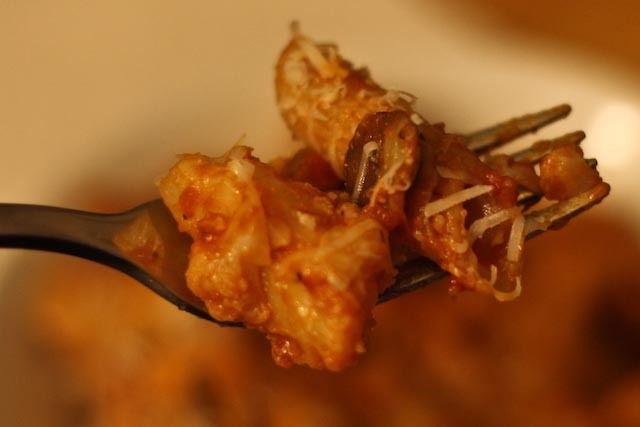 Tried this last night – a winner, and the kids ate it too! Helped that the cauliflower was almost hidden in the sauce. I might kick it up a notch next time with some red pepper flakes, but this was pretty good as is. Added a salad and some bread, and we had a delightful dinner. Awesome! I’m glad you liked it. I agree, I think some red pepper flakes would be a great addition to give it a little kick! This was one of the few recipes I wanted to try from Real Simple this month. I always search for reviews/comments before I try something new, and since I couldn’t find this recipe on the mag’s website (argh) I did a google search and was pleasantly surprised to stumble onto your changes for the very same recipe! And now I know about your website. Love the pictures! I will definitely try this recipe now with some of your twists (and I also printed your winter fruit salad and black bean cake recipes to try this week too). Thanks! Thanks, Julie! I’m glad you found the site as well. Happy cooking! !